Citizens unite! The race to stake your place in space has begun. 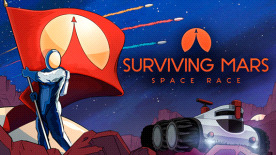 Surviving Mars: Space Race, the first major expansion from the survival management game Surviving Mars, is blasting off with a focus on mission sponsors and rival colonies. Pitting Earth's greatest countries and most powerful companies against each other, Space Race encourages players to choose their sponsor wisely as each has its own benefits and objectives, and other colonies are competing for the limited resources on the red planet. A Challenger Appears: Compete for milestones, already limited resources, and anomalies with several other AI colonies backed by rival sponsors attempting to set roots on Mars and vie to become this planet's superpower. You can trade with, respond to distress calls for, issue distress calls to, and even steal important colonists from these competitor colonies as you establish your territory on Mars.